We started bright and early in a very lovely part of Arlington, 8 minutes from Courthouse Metro, a few blocks from I66 and right next to the lovely McCoy Park. 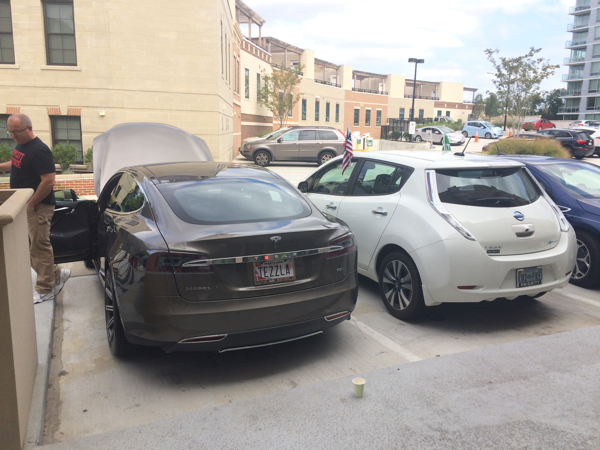 We had 3 Model S come for the first shift, while my best helper, Purcell Artis, helped me move our Tesla friends around and Denis Dineen's 5-year old Chevy Volt. Soon after, Dan Hale regaled us with his unique to Virginia, Powder Blue Chevy Spark EV. #CO2Fre was on display next to Purcell's Model S (pictured) for most of the event and Purcell did a great job chatting with folks, while event captain Jeffrey C. Jacobs gave out raffle tickets and coordinated logistics. Around noon Miriam from Arlington Weekly news came by and recruited Purcell to interview some of our EV drivers including Victor Rodriguez, who arrived in my favourite Focus Electric. Later, Mosiac Videographer Cliff Jacobs stopped by to check us out and Sean Ryan brought his Volt to end the day with us at 17:00. Special thanks to Anna at MOM's for hosting. If you can't make it to the biggest EV event on the East Coast then hop on down to Arlington, VA, where we hope to show the best of the electric life on two wheels or four. Miriam from Arlington Weekly news will be here to cover the event. We hope to schedule some interviews and hope you will all welcome Miriam. She has been covering our electric car events for years and is hoping to get some interviews for an upcoming segment. This year, we're holding a silent raffle. To be entered into the raffle, all you need to do is fill out a form with your e-mail address, name and any other contact information you choose to give, as well as if you'd like to receive more information. Submitting your email is only for the purposes of awarding prizes, and if you choose not to receive further information, your address will be disposed of upon raffle completion; feel free to use a disposable email address like at spamgourmet.com if you are concerned about this. Drawing will be after the final Drive Electric event on 18 September and winners will be contacted to collect their prizes. Registered attendees report 226,300 electric miles driven.